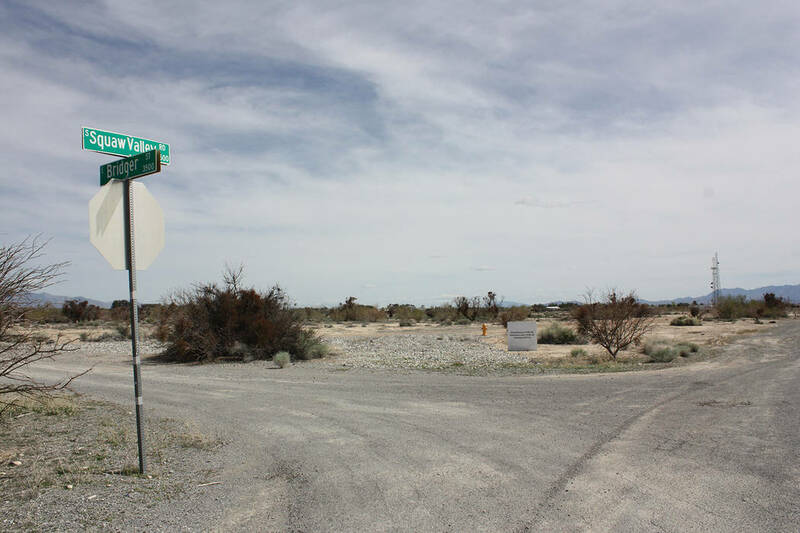 For over a decade, residents of the south side of Pahrump have been waiting for the development of Kellogg Park, a project which has experience repeated delays and stumbling blocks over the years but now appears to finally be seeing some momentum to carry it forward. Robin Hebrock/Pahrump Valley Times The intersection of Squaw Valley Road and Bridger Street, where the town of Pahrump will build Kellogg Park, is shown. Special to the Pahrump Valley Times This rendering of Kellogg Park was provided by the town of Pahrump's Buildings and Grounds department. 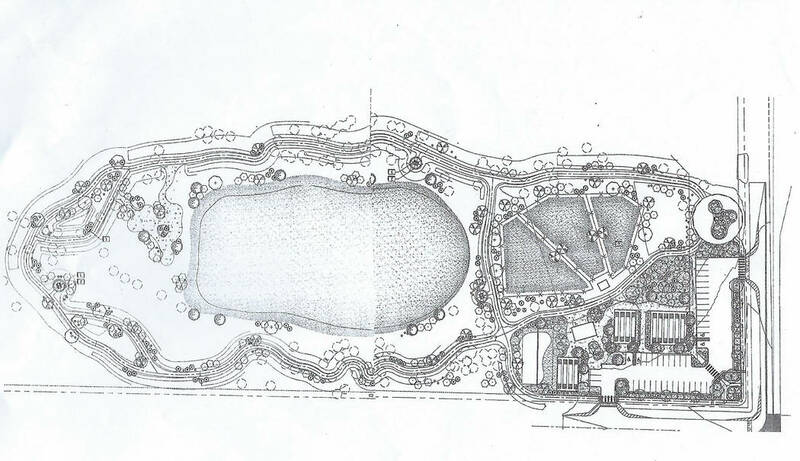 It shows the basic outline of the first phase of the park's development. Robin Hebrock/Pahrump Valley Times Taken Wednesday, April 3, this photo shows land that will eventually become Kellogg Park. The sign pictured announced a 2015 town meeting to discuss the specific features of the park, evidencing the lengthy amount of time the project has taken to get underway. 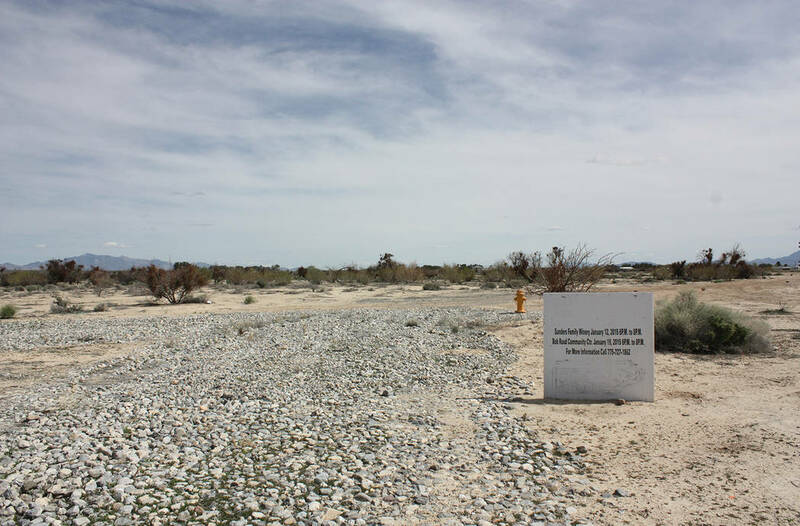 At its Tuesday, April 2 meeting, the Nye County Commission, sitting as the governing body for the unincorporated town of Pahrump, voted to award a $549,585 contract to Wulfenstein Construction Company to being the process of grubbing, grading and clearing the land that has been dedicated for Kellogg Park. Wulfenstein Construction was the sole bid submitted after the contract opportunity was advertised both in Las Vegas and Pahrump newspapers. McKee also noted that the park is being partially funded by a grant from Nevada land and water conservation fund, the amount of which was previously reported at $211,519. Blundo questioned whether prevailing wage applies to the project, to which McKee confirmed, “Prevailing wages are paid on this project,” she explained. “That’s what we have found out. The initial bid came in so much higher than we had anticipated because the original engineer’s estimate did not account for prevailing wages. Blundo noted that the public should keep in mind that there is currently an Assembly Bill, AB136, that aims to lower the threshold for prevailing wage projects from $250,000 to just $100,000, which could have a major financial impact, not just in Nye County but throughout the entire state. “It’s not just sticker shock, ladies and gentlemen. It’s extortion almost,” Blundo said. Nye County Commissioner Lorinda Wichman chimed in, “If they (prevailing wage bills) all pass we can just take them the keys to the county,” prompting murmurs of ironic agreement from the audience. The motion to award the contract passed unanimously. Kellogg Park has a total of 80 acres dedicated toward its development, located on land bordered by Squaw Valley Road, Bridger Street and Kellogg Road, with construction planned to take place in multiple phases. In January 2015, it looked as if the park would be moving forward after years of delay, with the town hosting a series of public meetings, inviting the community to share their ideas on what the park should include. One of the signs announcing that meeting is still in place four years later, highlighting just how longstanding this project has been. From those 2015 meetings, it was determined that the park should include parking, a restroom, a walking path, a large grassy area, separate dog parks for various sizes of canines, and more. Pahrump Buildings and Grounds Director Matt Luis emphasized that the work approved on April 2 was more than simple grading and clearing and would in fact include the laying of the essential groundwork for the overall layout of the park. “What we’ve got to do is make sure that people understand, they (Wulfenstein) aren’t just going out there and flattening the ground and clearing trees and then walking away. Luis also noted that there will be a groundbreaking ceremony hosted at some point in the coming weeks and that would be announced as soon as the details and final dates for commencement of construction are determined. Blosser Ranch Park, 2300 N. David St.
Ian Deutch Memorial Park, 1600 Honeysuckle St.